It came to work on Friday. When a co-worker let me know that FedEx was there with a package for me, I quite literally clapped my hands in glee! 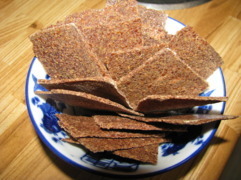 As soon as I got home, I made a recipe for sweet flax crackers. I figure crunchy crackers are a good way to start getting to know Arthur--it's not like I can readily screw them up. If I leave them on for an extra hour, they're not going to burn or anything, they'll just get crunchier. And since crunchy is what I'm going for, all's well. They turned out quite well--just like they should have, in fact! Not bad for my very first attempt at dehydrating! I ended up leaving them in for a few more hours than the recipe called for, because I wanted them crunchier than they were at the "done" point. It's been pretty humid here lately, and I'm sure that made a difference in how long it took as well. Process the pecans and sunflower seeds into a fine grind using a food processor, fitted with the “S” blade. Add the hemp seeds and pulse to thoroughly mix. Set aside in a large bowl. Add the chia (or flax) meal to the ground nut/seed mixture and stir to mix. Process the sun-dried tomatoes, ginger, garlic, and salt in the food processor. Add the carrots, celery, red bell pepper, zucchini, onion, lemon juice and water and process. Don’t process too much or it gets mushy. Transfer this vegetable mix to the bowl with the ground nut/seed mixture. Add the dates. Toss briefly to incorporate. Take 1/3 - 1/2 of the mixture and place back in the food processor and pulse a few times to mix. Transfer to a new bowl. Repeat that process until you’ve done that with all of the mixture. Form 1/3-cup patties and enjoy on a crisp lettuce leaf as your bun. Or for a more gourmet bun, use two slices of Raw bread. On another note, I think, though I'm not sure, that I may be detoxing a little. I had assumed that it was allergies, but I haven't had them in a number of years, not really, and medication isn't doing anything. I spoke with a friend who is on her own raw food journey--though much more raw than than I am, and much more permanently--and she suggested that I familiarize myself the symptoms of detox, because it's entirely possible that's what I'm feeling. It would certainly explain why nothing I do seems to help! If it is detox, then it's a good thing, because better out than in!! My challenge at the moment, as I think I mentioned in previous posts, is to finally break my compulsive need for junk. I've been working on it, and decided a good first step would be that if I really really wanted it, then to have it, but NOT to buy (and thus consume) the mass amounts that I want at the time. If I buy a small amount, and enjoy that, I'm much more likely to just consume that small amount. Am I going to go out again and get more? Unlikely. So that's what I've been doing, and I found that I've had much less--even though I'm normally craving-crazy during this time of the month. Interesting! I also think that eating so many more nutrients has eliminated some of my cravings, because the monster-need hasn't been there at all. I can't believe that I'm more than halfway though my "mostly raw for 30 days" experiment. I already know one thing for sure--after I'm done with this month, I'll definitely be continuing with raw foods, as much as is reasonable. During the summer it will be much easier, so I'll likely be more raw, but as the growing season closes the choices will be a lot less, and with the cold winters here, I'm going to want hot food. And that's OK! So long as the food I eat, whether hot or raw, is healthy, I'll be the better for it.